Bowing Down Home is a detailed website devoted to the fiddle traditions of Prince Edward Island. The site includes videos, photographs, music files, and interviews (both as audio files and as transcriptions). Much of the website is devoted to fiddle music, of course, and there is also a lot of material on PEI step dancing. 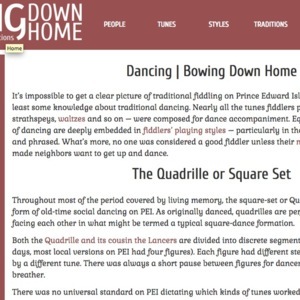 The site includes an overview of PEI square dance traditions, of course, noting "It’s impossible to get a clear picture of traditional fiddling on Prince Edward Island without also having at least some knowledge about traditional dancing." Another page is devoted to "Old-time Dances." Another page looks at Community Dances, including a detailed discussion house parties. The four couple squares in recent years were supplanted by the big circle style of dancing. Here are some items that may be of interest. 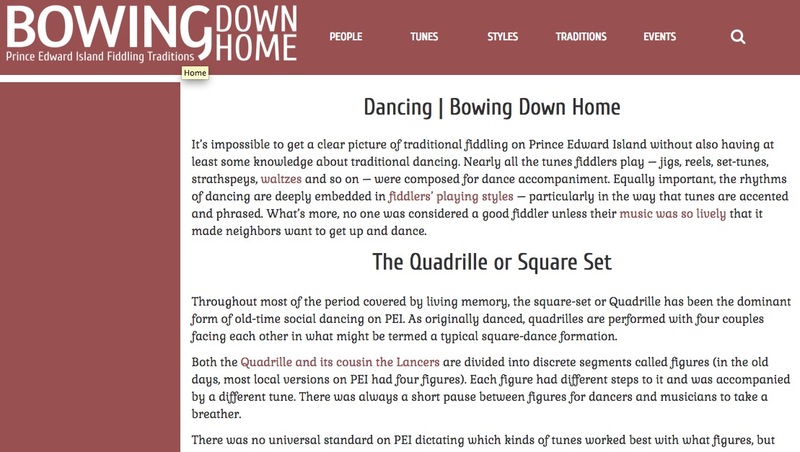 Ken Perlman, “Prince Edward Island - quadrilles,” Square Dance History Project, accessed April 26, 2019, http://squaredancehistory.org/items/show/1677.